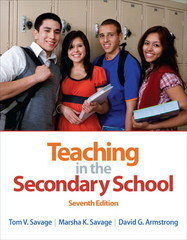 Teaching in the Secondary School 7 Edition Teaching in the Secondary School, Seventh Edition, utilizes using a reflective approach to learning and prepares secondary school teachers, in an era of change, for the realities of teaching in today’s classrooms . Highlighting critical issues such as diversity, differentiated instruction, cooperative learning, direct instruction, higher-level thinking, assessment, planning, classroom management, legal issues that teachers may confront, and career-long professional development, this thoroughly updated and revised text equips teachers with the tools they need to successfully face the day-to-day classroom environment, and the real challenges facing today’s secondary school students and educators. This edition features all new information on: education reform proposals, such as: Race To The Top and Breaking Ranks, and how the role of secondary teachers is changing; diagnostic, formative, and summative assessments, and a new emphasis on planning assessment prior to planning instruction, outlined in the “Backward Design” model; writing across the curriculum and the increase in integrating literacy across the curriculum in all secondary classes; bullying, cyber-bullying, school violence, and drug abuse, including legal issues and school responsibility alerts teachers to the serious misbehaviors that exist in today’s schools and one of the most common and pressing concerns of new teachers; and the tremendous opportunities the internet provides for professional development purposes, such as using webinars, podcasts, and e-workshops.